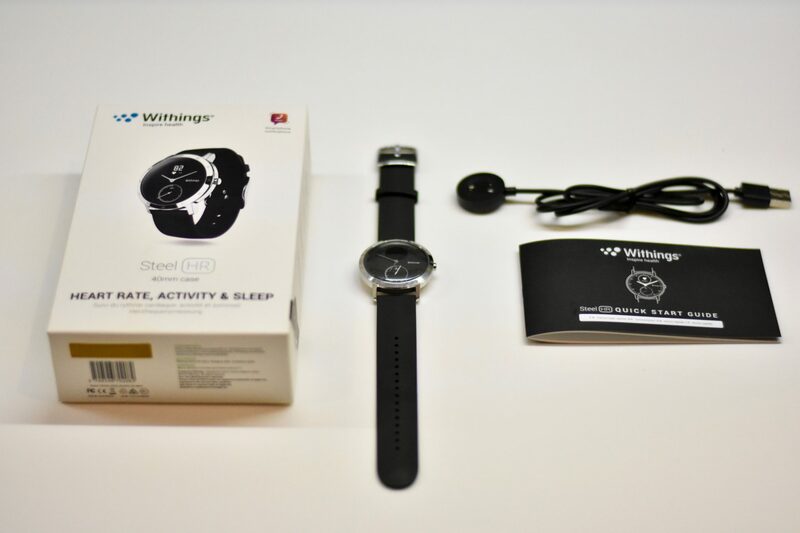 Note: For this review, Withings kindly provided me with the Withings Steel HR, which I am to return after testing. This has allowed me to fully test all the features and put the watch through its paces so I can give the best informed review possible. The introduction of the Withings Steel HR was the first of the Withings line of activity trackers to include optical heart rate tracking. This was the final piece of the jigsaw that Withings needed to add to complete the full set of activity tracking capabilities that one would expect, whilst also maintaining their trademark elegant and sophisticated design. Yet adding optical heart rate wasn’t the only upgrade introduced into the Withings Steel HR over the preceding Withings Activié models. 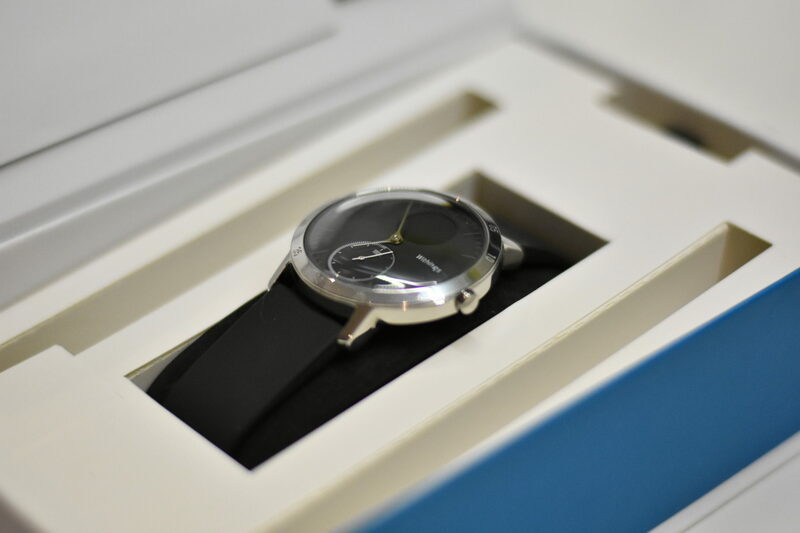 This is also the first Withings watch to include a digital screen, which – despite small – gives all of the tracked data collected by the watch in real time along with smart phone notifications. This precise attention to detail within both the hardware and software design has resulted in a concealed and deceptively powerful watch come activity tracker; one that never loses any aspect of its assumed class or ability to be an everyday timepiece. As Apple have been famous for, it is not just the product which counts, but also the packaging. Withings followed suit here, making a minimalist box to go alongside the Withings Steel HR. Upon removing the outer sleeve one is greeted with a sleek white box where the Steel HR lives. This is easily preyed open by the magnetic latch on the right side of the box, revealing the sparkling Withings Steel HR at the centre. That is all there really is to it. Simple. Hidden behind the watch is the charging cable which attaches to the underside of the Withings Steel HR, allowing it to sit flat whilst charging. Note: to charge the Withings Steel HR, align the magnetic electrical connections on both the cable and the watch. Finally, there is a quick start guide which helps with the initial set up process which I’ll now go into more detail on. On the Withings Steel HR, there is only one small button on the right hand side. 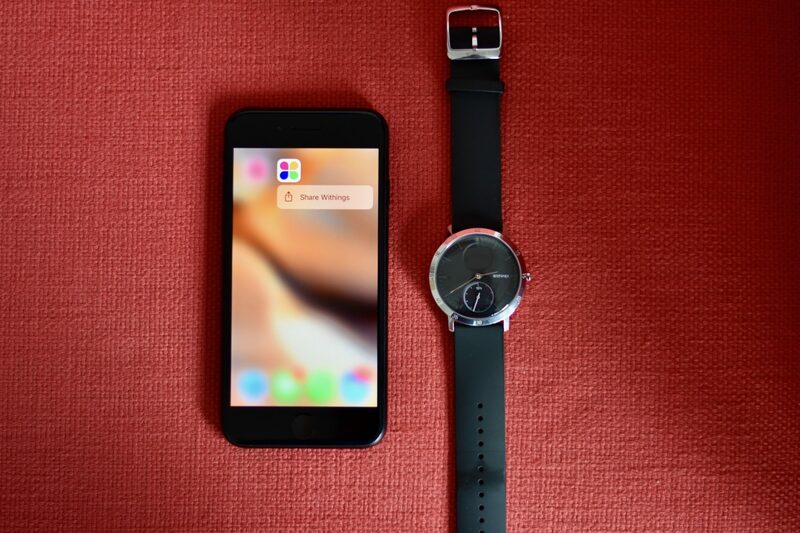 Once pressed, the watch will start and prompt a connection to a smartphone. 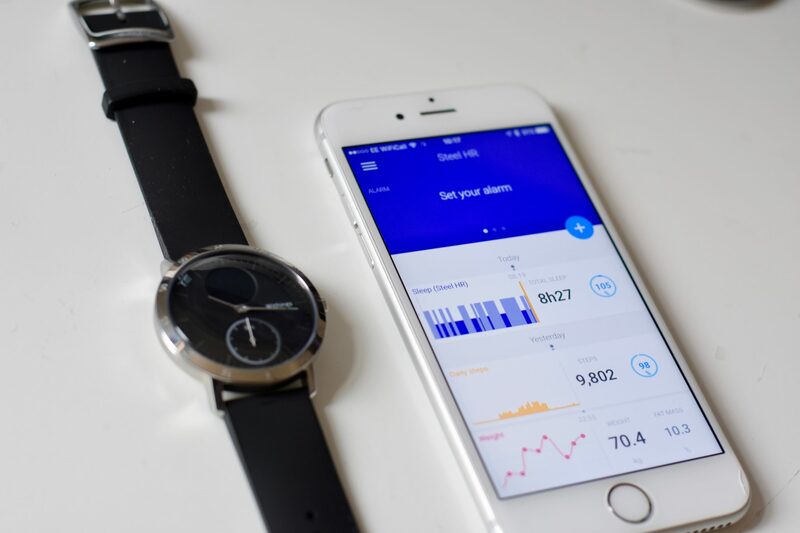 To do this, the Withings Health Mate application must first be downloaded which is compatible with both Android and iOS platforms. From here, the set up and installation process with the Withings Health mate app is as fluid and intuitive as one could hope for. All done via Bluetooth, the watch is detected by the app automatically allowing the two to pair and the Withings Steel HR to activate. 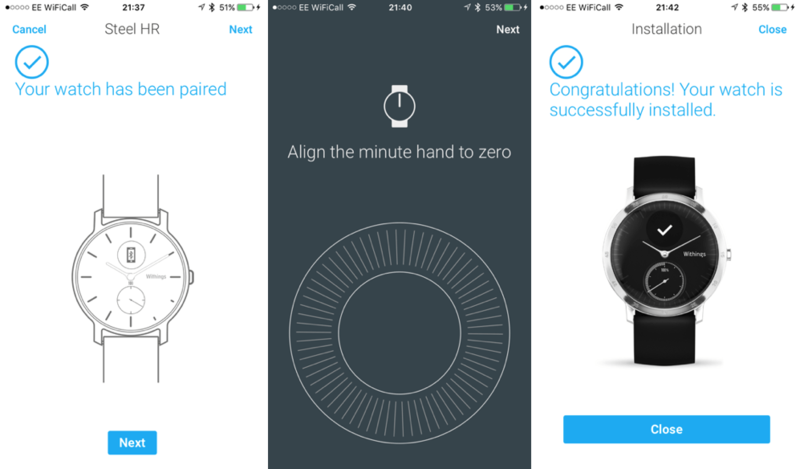 There is a cool final calibration process where one controls and aligns the hands of the watch from the app; scrolling on an early iPod-esque wheel to align the minute hand to zero to complete the final ‘installation’ process between the watch and the app. Straight out of the box, the watch has about 80-90% charge allowing the user to get straight into wearing it and tracking day to day activity. From a design standpoint, the Withings Steel HR is one of, if not the best looking activity trackers on the market, with the biggest competition also coming from Withings; offering their lower end Activé models as one of the smartest activity trackers one can buy. However, other companies are branching out into this fashion orientated approach to designing fitness and activity trackers. Apple in particular took a strong standpoint when they first released the Apple Watch, throwing it straight into the spotlight with the likes of Beyoncé flashing her gold Apple Watch everywhere she went. This niche, design focussed market has given Withings the perfect USP with their Activé and now Steel HR ranges, being one of the best designed – whilst also capable – activity trackers around. The Withings Steel HR comes in a few various options. There are two size variations: a 36mm case (this is the diameter of the watch) or a slightly bigger 40mm case size. The 40mm version is not only larger diameter wise, but also incorporates engraved digits at 5 minute intervals around the circumference of the watch bezel which is a touch deeper than the more minimalist approach seen on the 36mm Steel HR. The final variations in design come from the colour options. 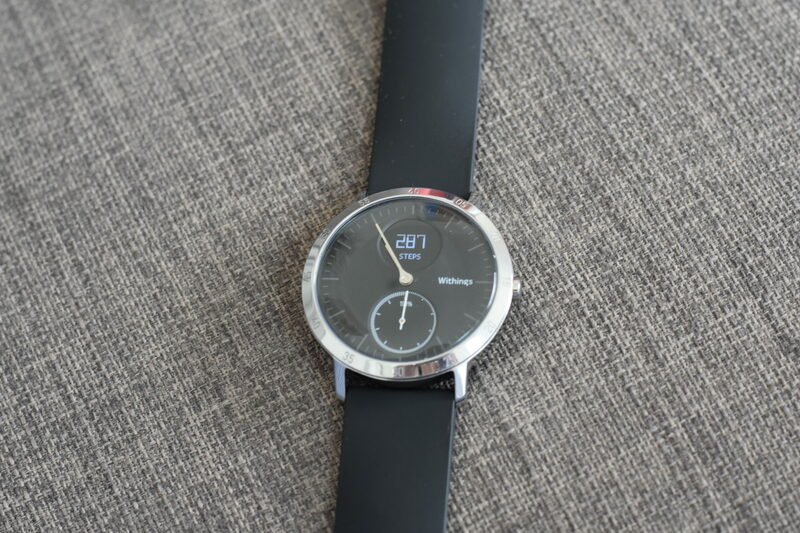 I feel like Withings have deliberately retained a simplistic approach here, with the Withings Steel HR 36mm cased watch coming in either black or white, whereas the 40mm cased watch is only available in black. Finally, a higher level of customisation can come via the interchangeable bands which easily pops out by sliding the small clip to the side allowing the axel to come out of the case. The only thing to note here is that for some reason, all of these additional bands are only suitable for the 36mm models rather than the 40mm model. This just leaves the generic black silicone band on the 40mm case unless a third party band is purchased; of which there are hundreds available off Amazon. I am also not the biggest fan of the silicone strap. It is likely too long for most (a second smaller strap should be provided as most other watches do so) with it flapping about even when well done up. I have also seen noticeable wear and erosion of the matte coating on the strap around the buckle area which is unfortunate but hidden at least when being worn. Other than this, the minimalist design of the Withings Steel HR stands out; being clean and simple whilst also incorporating intricate design features which cannot be found on an every day watch. Two chrome hands take centre stage to tell the time in the traditional way, with a second smaller dial displaying how much of the step goal has been completed. Finally, the biggest new addition to the Withings Steel HR – other than the optical heart rate – is the small digital LED screen, situated directly above the goal dial. This tiny circular display gives all the information needed from the number of calories burned to incoming calls, but more on this later on. 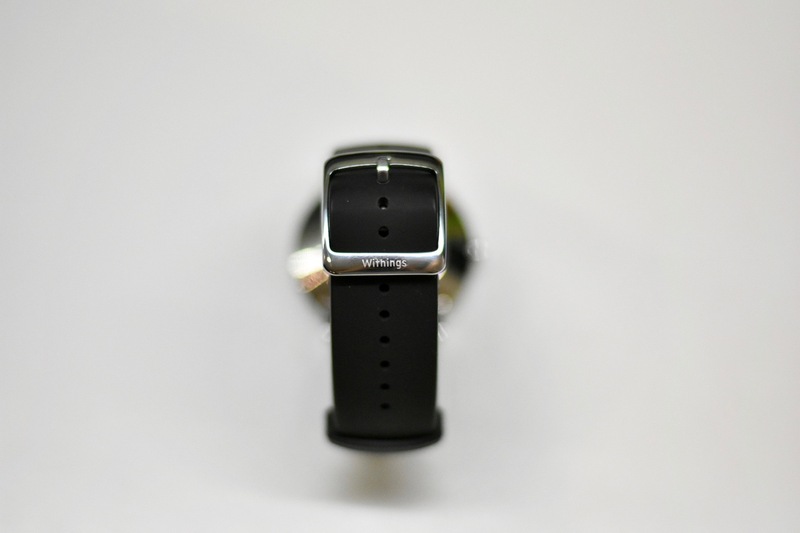 The backside of the watch is equally clean; featuring only the two LEDs for the optical heart rate sensor along with two small metallic connection points for charging. The Withings Steel HR has a deceptively long battery life given its size. Off a single charge, 25 days worth of activity tracking is available, along with another additional 20 days on top of that in power reserve mode. In this mode, steps are still measured along with the time still being shown, however the screen won’t work along with the heart rate monitor. Given this battery life, activity tracking on the Steel HR is thorough and continuous, all day, everyday. 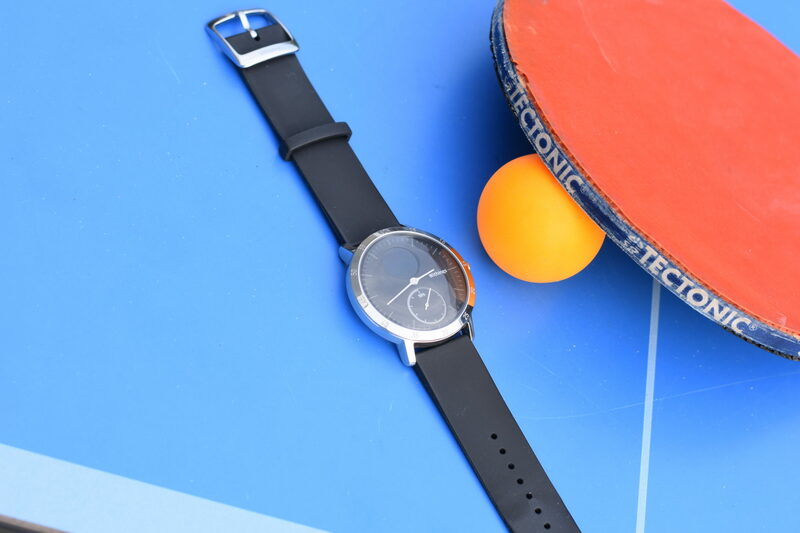 The watch is capable of seamlessly transitioning between general step counting, to determining sleep metrics, to detecting that table tennis is being played next. As designed to be so, the Withings Steel HR looks and feels like an every day watch – yet just happens to have activity tracking features aplenty. This means it acts as any other time piece would do so, although I still found myself using the digital crown (button on the side) to have a digital time pop up on the same LED screen. Being lightweight and comfortable, the Steel HR remained on my wrist almost 24×7 throughout testing. Being waterproof to 5ATM (50m) it was easily able to handle rain and showers. Withings are more than just a fitness and activity tracking company. They encourage and provide products to help improve, stimulate and create a healthy lifestyle as a whole; from blood pressure to body temperature to sleep health, Withings meet all requirements. This is not gone unnoticed with the Steel HR which has a clever little alarm system built in which softly wakes the wearer up via vibrations at a set time by the Health Mate App. Unfortunately, the Steel HR does not cater for 24×7 heart rate tracking unless in activity mode (mode details on this further down). But by pressing the digital crown a few times to scroll through the data fields, it is possible to get a reading there and then of the resting heart rate. The accuracy of this reading is very arbitrary and irregular, sometimes very high and other times way too low.I have found that giving the watch some time on the optical heart rate screen allows it to steady out and give a more accurate reading. As to be expected by any activity tracker, the Steel HR has the ability to measure steps, distance walked (roughly) and calories burned (again, a rough estimate). The accuracy is neither here or there when it comes to the number of steps counted, which is the same for all activity trackers on the market. All will have their own algorithm and method of determining number of steps and all will give fairly accurate readings within about 10% of one another. Note: I compared the iPhone (17,400), Garmin Forerunner 235 (18,211) and the TomTom Touch (16,926) at ISPO Munich and all gave different readings yet none was more than 8% different to the other. Therefore one must always take the number of steps recorded with a pinch of salt. 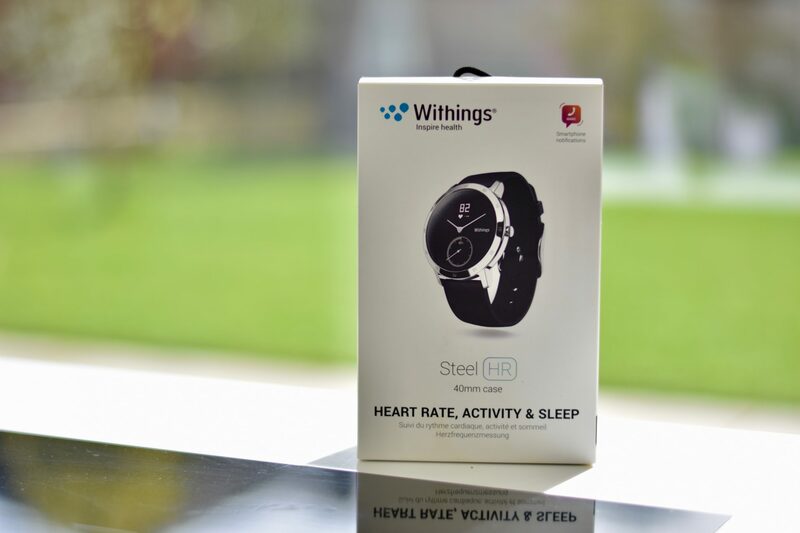 Wearing the Withings Steel HR all day every day alongside a range of other activity trackers, it has shown to give consistent and stable numbers. One of the best examples of this was shown on a long run. I wore the Withings Steel HR on my right wrist, with the Garmin Forerunner 235 on my left. Over the course of the 10 mile run, both watches recorded 11,428 and 11,360 steps respectively. When it comes to setting a step goal, this is down to you. There is no auto goal which adjusts to the number completed each day and therefore remains the same until manually altered. But a good rough guideline to stick to would be 10,000 a day. Based off the number of steps and rough gait length, the Steel HR will also estimate distance walked/ travelled although as there is no in-built GPS this is only a rough estimate. The bottom dial on the watch will show how close one is to 100% of the goal and will then continue round once the goal has been surpassed. Viewing your data is equally easy via the Withings Health Mate smartphone app. A quick snapshot of the day’s step count at the top of the timeline or the the in-depth analysis of your daily activity. Here, statistics of the most active times of the day are shown alongside distance and calories. Now with the inclusion of an optical heart rate monitor on the Withings Steel HR, the overview of the day also includes heart rate variability over the course of the day (I will go into this is more detail further down). 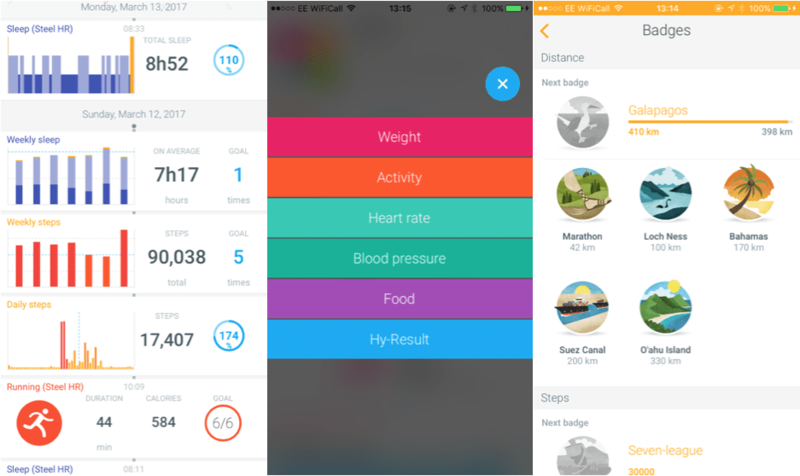 The way in which the Withings Health Mate app displays the data is very interactive and clear, to a much greater extent than competitors of Apple Health and Garmin Connect. Withings also tap into the competitive nature of humans by offering badges and awards gained from walking various lengths (200km for example). Withings then associate this distance with a place such as 200km equating to the length of the Suez Canal. This is just a nice extra incentive to walk and run further. In my time testing watches and activity trackers for companies, I have experienced a range of sleep trackers. 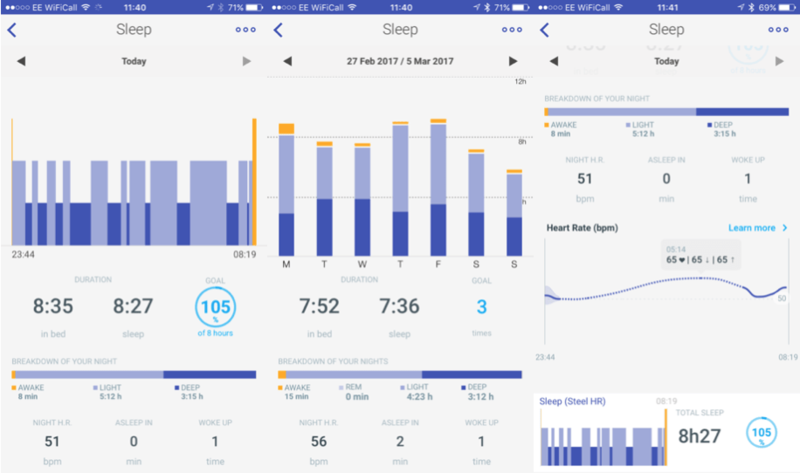 For example, the Garmin Vivosmart took the approach where one sets the tracker into sleep mode and again awakes it in the morning. This led to problems of forgetting to put it into or take it out of sleep mode. Therefore, all modern activity trackers are able to automatically track sleep metrics. This is the same on the Withings Steel HR which will take into account movement and heart rate to determine when sleep has started. I have actually found this to be incredibly accurate and very impressive, giving a consummate of sleep data which does not stop at number of hours slept. 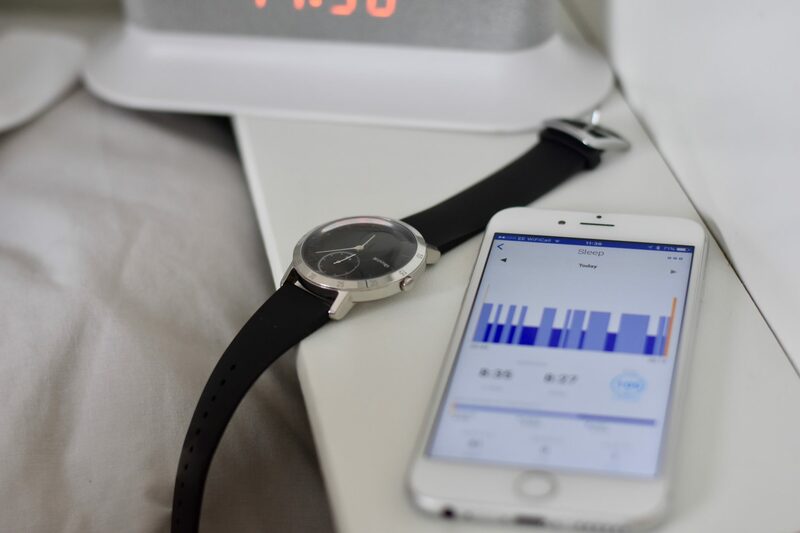 The Steel HR can also track the length of time it took to get to sleep; the number of times awoken during the night along with the length of deep and light sleep. All of this is none too different from what is offered by other companies but I was pleasantly impressed with its accuracy. As with the all day activity tracking, the Withings Steel HR uses the optical sensor to record heart rate throughout the night. Personally I have not found this to aid or give me any beneficial results to analyse and look at to help sleeping. Whether a gimmick or just another piece of data for those obsessed with every last metic, it is interesting nonetheless to give an idea of sleep activity. 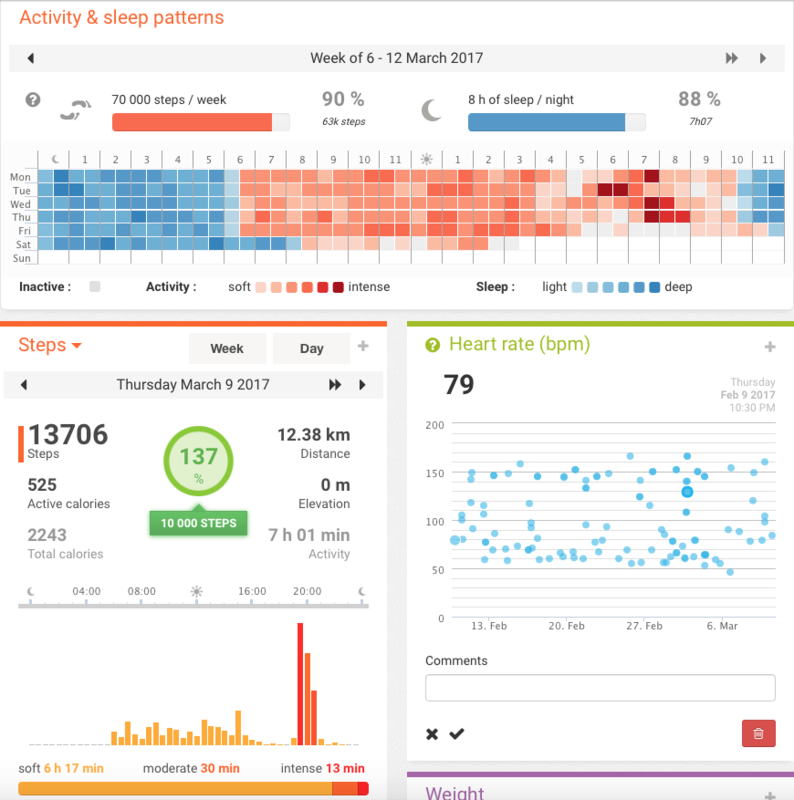 As I have been reiterating through this post, the Withings Steel HR is so much more than just an everyday watch that can count steps. 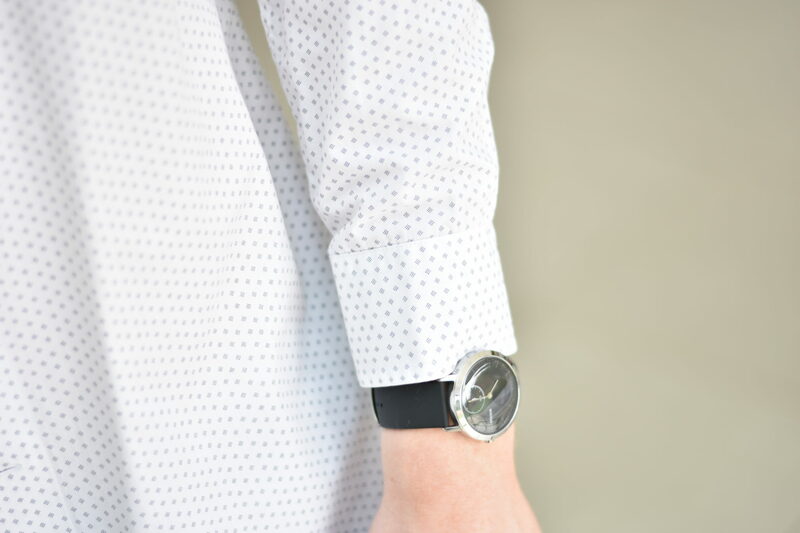 From just the flick of the wrist the Steel HR will be recording the movement of an activity. Although this does sometimes lead to confusion with it often picking up showering as dancing. The Withings Steel HR has the ability to know and detect up to 10 various sports and activities; from running to weightlifting to volleyball to dancing, there won’t be an activity that will be missed. To not run the risk of missing an activity however, simply hold down the side button until the watch vibrates and this will start a workout with full heart rate tracking. This activity will continue until the digital crown is once more pressed and help, ending the workout. Simple as that. Despite the watch not being integrally designed for exercise, it is still undoubtedly capable in this field, handling the recording of activities without a problem. I would definitely say however that it is better at the more intense activities such as running in comparison to a sport of table tennis. This is because the movement involved in table tennis is often not too great at amateur level, meaning the watch will struggle to determine the activity whilst also not turning on continuous heart rate tracking as a result. So even though the Withings Steel HR has the ability to automatically determine and start recording activities, it is still best to manually start a workout to ensure 24×7 continuous heart rate tracking. The Withings Steel HR is primarily an activity tracker which is branching out into the fitness world, allowing you to track workouts and heart rate but without the built in GPS of the serious fitness watches. Therefore, the heart rate sensor will not have necessarily been of upmost priority when designing this watch, leading one to expect results not to be to the high level of accuracy given by full sport watches like the TomTom Spark 3. Despite this initial assumption, Withings have certainly held their own with the heart rate monitor when it comes to workouts. On almost all runs it has been consistent without any dropouts or wild data points. When looking at accuracy on steady runs (one without any sudden changes in exertion), I find it best to look at the final average heart rate value. 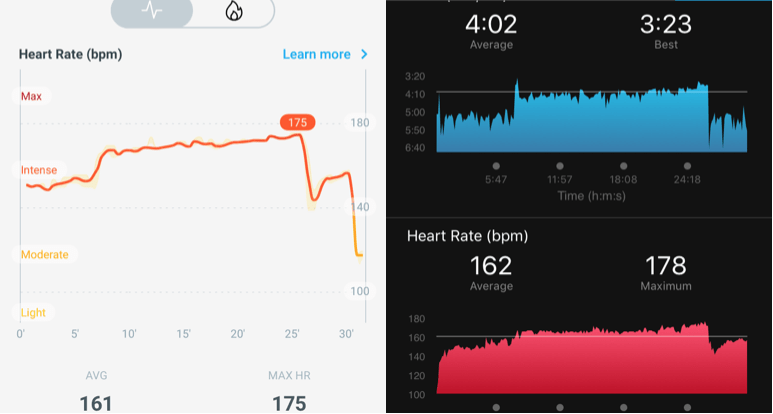 Looking back over the results from multiple tests I have done, the Withings Steel HR has shown consistent and encouraging results when intensity remains steady. First and second graphs from Withings Health Maet refer to first and second graphs from Garmin respectively. On these steady runs, the average heart rate has been near identical with those results cross referenced with the Garmin Forerunner 235. For example, a steady 5 mile run gave 164 and 165 beats per minute respectively for the two watches. It could be thought that this was just by chance for the two to be so close, however similar results were seen across all runs of this type. 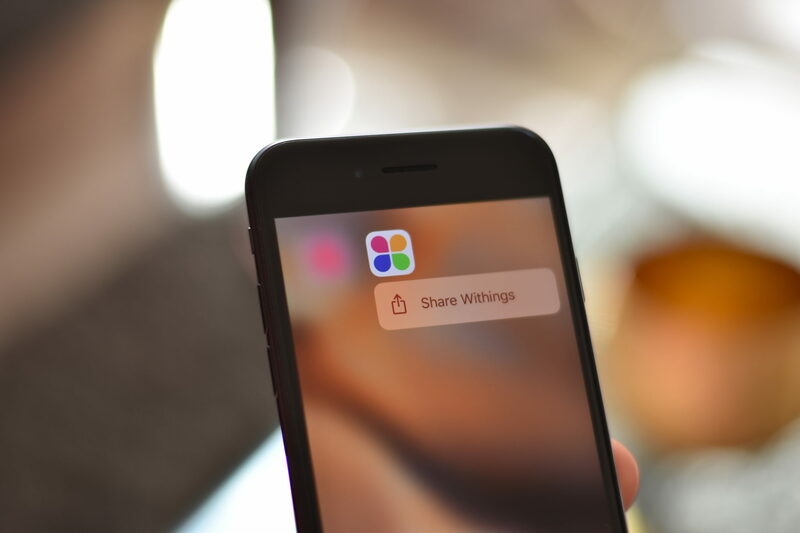 Unfortunately – the same is with Apple – Withings do not allow activity data to be exported from the app and it can neither be viewed online. Therefore, the only data for comparison is the maximum and average heart rate values, along with the slightly simplistic graph found in the Health Mate app. Yet still, the grey areas surrounding sudden changes in heart rate which occur during interval training are still an issue with the Steel HR. Saying this, sudden changes are an issue almost across the board when it comes to optical heart rate, with the chances being that the Steel HR is not the most likely watch used when interval training. Albeit hard to analyse without exporting the data, I have seen the heart rate monitor capable of reacting well to recovery periods and increases in heart rate over time. In a session for example which involved a warm up, 5km tempo then a cool down, the Steel HR gave encouraging heart rate results, clearly showing the gradient of heart rate to increase throughout the tempo and then quickly fall off once the cool down period began. 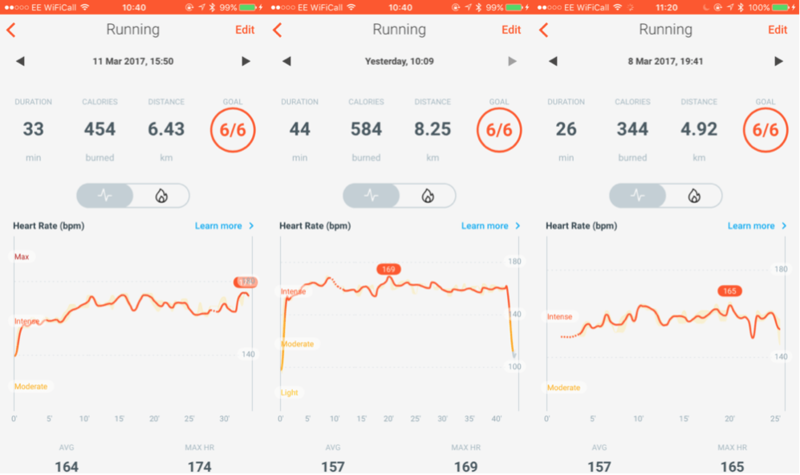 These results were easily identifiable with those seen on Withings’ optical heart rate compatriot of the Garmin Forerunner 235, showing a concurrent spread of data. 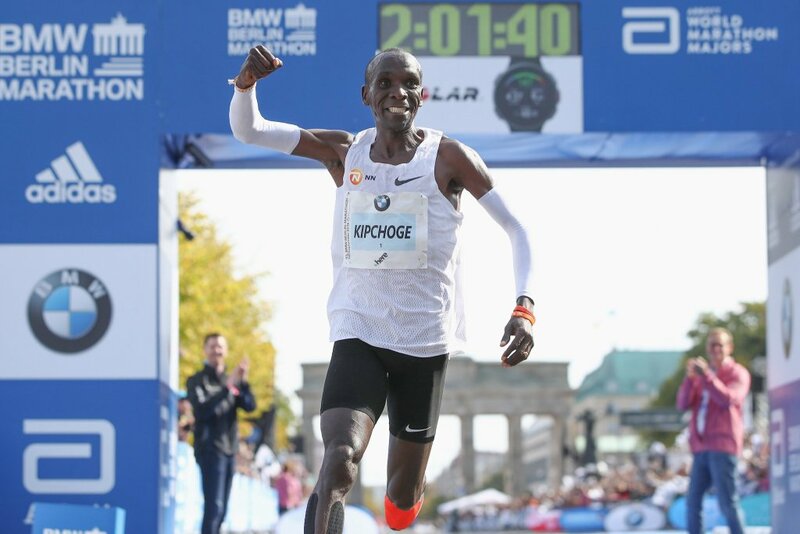 More encouraging results from tempo running, Withings and Garmin in agreement. Therefore, despite the struggles with resting heart rate measures taken at one off instances, the Withings’ heart rate monitor when used during workouts has established itself to be a convincing piece of technology ready to compete with the other watches on the market. 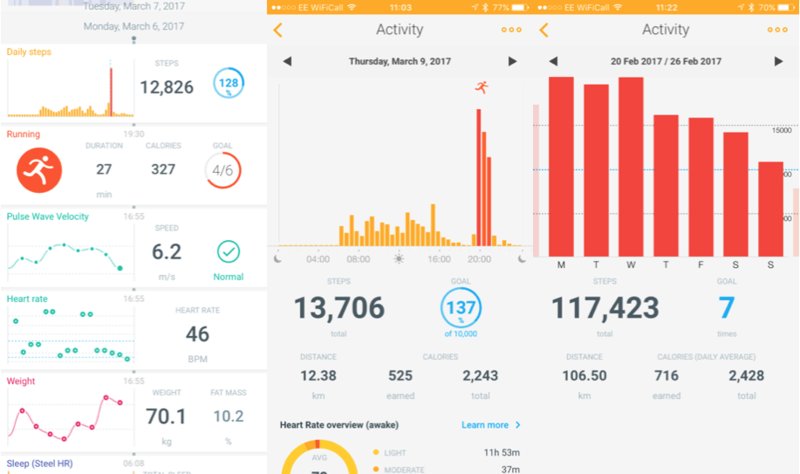 I have already talked quite in depth throughout this post about the Withings Health Mate app; the smartphone application which pairs wirelessly to the Withings Steel HR, displaying all recorded data. 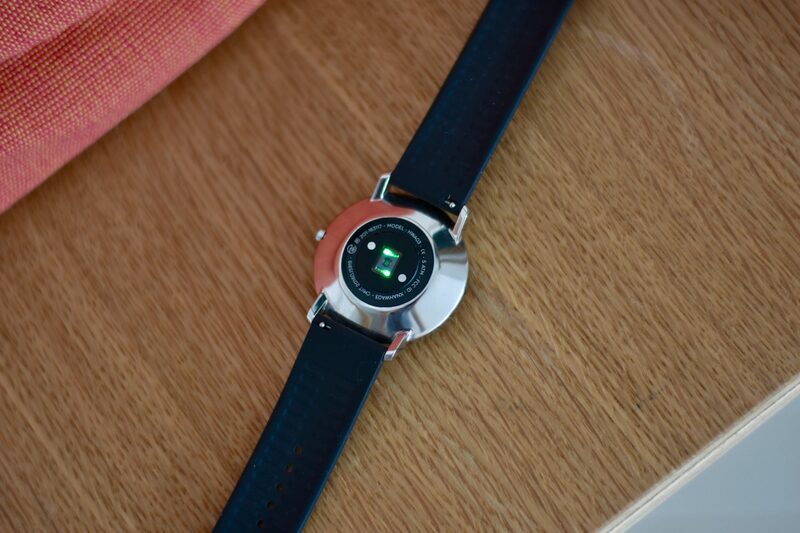 When setting up the Steel HR, the device prompts a connection to a smartphone via Bluetooth which gets the watch up and running with the Health Mate app. From here, all of the data is quickly synced and shown on the app. Health Mate has two main sections, the timeline and the dashboard. On the timeline, all collected data is shown chronologically, steps, sleep, heart rate, etc. They’re all included. From here, just tap on one of the small widgets to gain a more in-depth view of the data field as shown above. The badges on the timeline maintain motivation, whilst personal goals can also be added and aimed for to increase daily activity. The dashboard is another way of quickly viewing data from the Withings Steel HR, giving the main points of interest at the top. The dashboard I have found to be useful for adding extra pieces of information to the Health App which may have been missed but eh Steel HR if not being worn. Here, food intake and extra activities can be added to name a couple. Withings also have an online site (https://healthmate.withings.com) which is essentially the same as found on the Withings Health Mate app. However, the online version has no way of viewing recorded activities and is a bit old fashioned all round. It is far from as intuitive and smooth as the app, with a very confusing outline of weekly activity at the top, adding nothing to the data collected. Other than the online version of Health Mate, Withings certainly have done a good job with their Health Mate smartphone app which offers a very clear representation of the data. 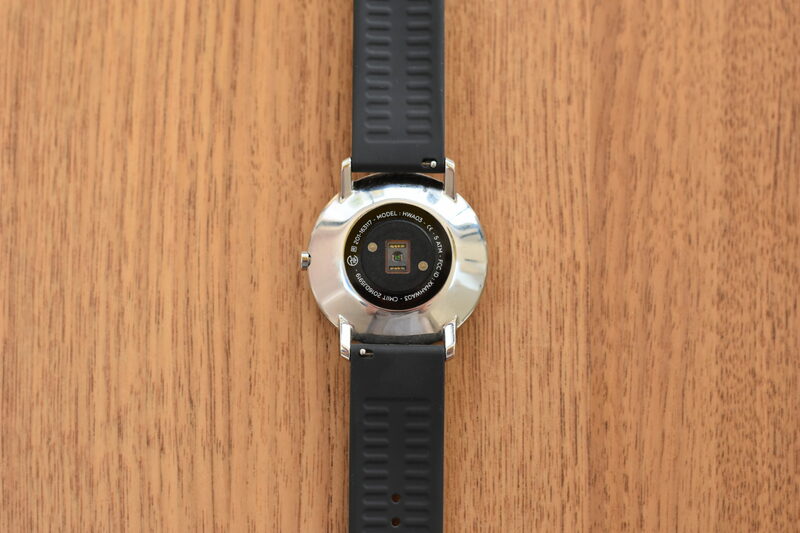 Not only does the Steel HR have the ability to connect to the Health Mate app on a smartphone, but it can also detect and notify of an incoming text or call. 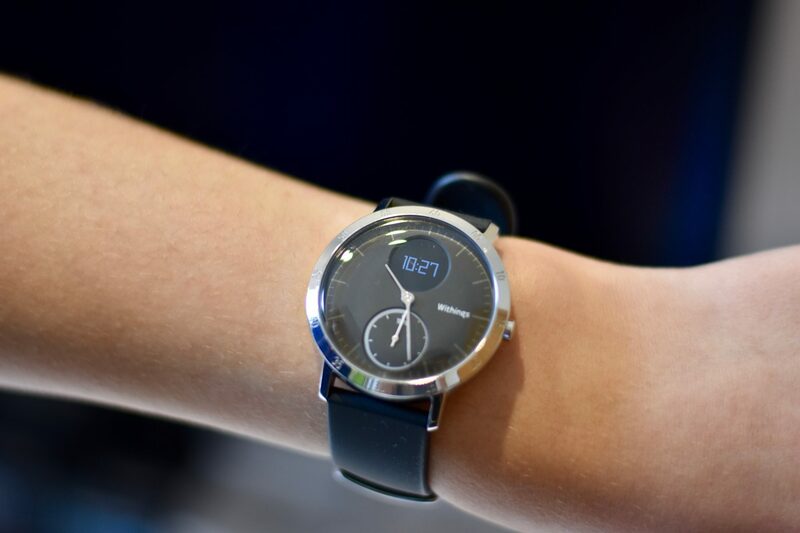 When connected via Bluetooth, the Withings Steel HR gives an alert through a soft vibration of either an incoming text message or call, along with a display of the name of the person who is calling on the small LED screen. I found this to be a very nice extra feature, which doesn’t give any interaction with the notification, yet subtly provides an impulse to the fact a notification has been received. Unfortunately for now, these notifications are restricted to text messages and phone calls, not offering third party notifications from apps such as WhatsApp which is a shame. I have been using the Withings Steel HR now for about a month and have found it to be the all round activity tracker. I was often put off by other trackers as they looked like a futuristic, out of place rubber band, yet the Steel HR completely rewrites the preconceptions surrounding wearable technology. The design is a strong and bold statement of how a classic watch should be, but incorporates all the latest and most sought after technology which many more fitness obsessed people are craving. 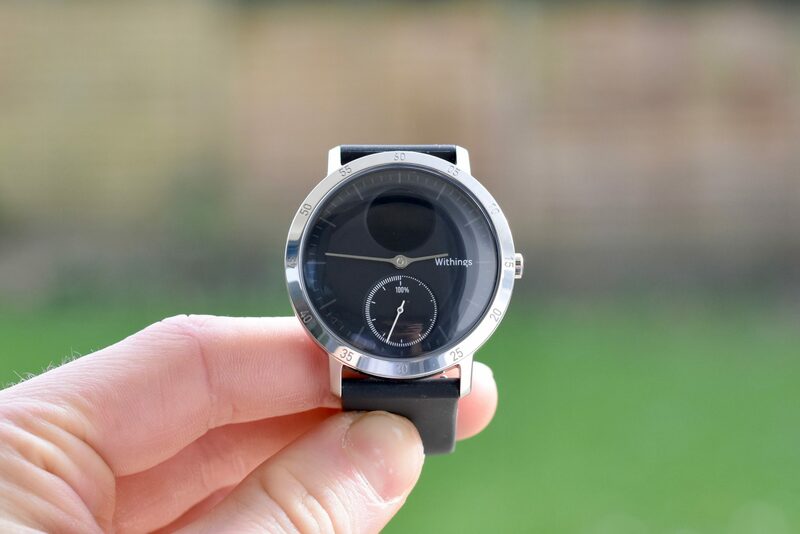 I have been able to wear the Withings Steel HR as my everyday watch, not once feeling self conscious that it may look out of place, whilst constantly having the day tracked, analysing sleep movement and heart rate with impressive accuracy. Withings have undoubtedly built upon the Steel HR’s predecessor – the Withings Activé Steel. 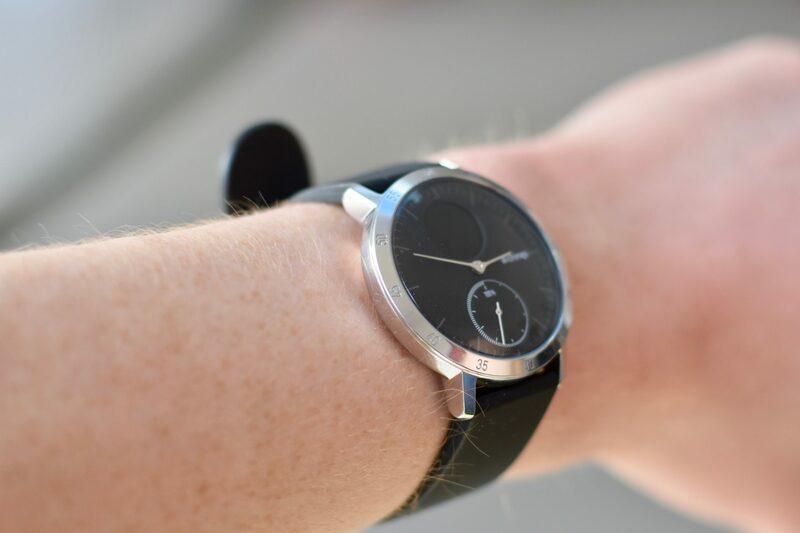 The addition of a screen, phone notifications and heart rate give the Withings Steel HR all the arsenal an activity tracker should need whilst remaining a sleek, fashionable watch, for me making this the go to activity tracker on the market. The Withings Steel HR is available from their website here. Amazon link for the UK is available here.